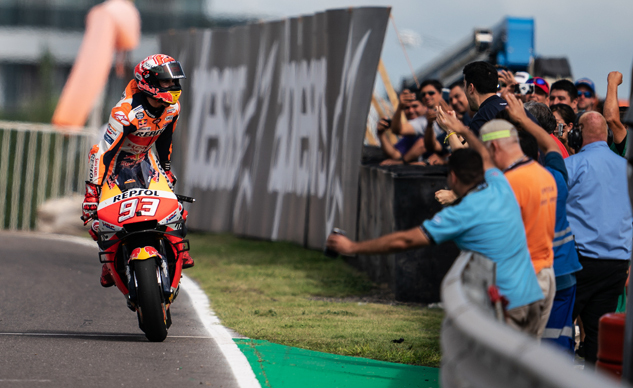 The 2019 Argentine Grand Prix produced another dominant display by Repsol Honda prodigy Marc Marquez. A benevolent dictator, Marquez allows the other MotoGP riders to follow him around these tracks, not bothering to charge for lessons. Today’s easy win at Rio Hondo was the Catalan’s third in Argentina, putting him on top of the championship standings and bringing a sense of foreshadowing to the rest of the grid. Marc Marquez ends a two-year winless drought at Rio Hondo, avenging last year’s 18th-place finish and the DNF in 2017. Conditions on Friday and Saturday were clear and warm, conducive to fast times. The top five finishers at the end of the day on Friday included Andrea Dovizioso, Jack Miller (? ), Maverick Viñales, Cal Crutchlow and impertinent rookie Fabio Quartararo, enjoying another fast, fun weekend on the Petronas Yamaha M1. Marquez, getting serious on Saturday, led the way into Q2 joined by Lorenzo, both factory Ducatis and all four Yamahas. Miller on the Pramac Ducati and Crutchlow on the LCR Honda completed the front row and rounded out the lambs heading straight for Q2. Takaaki Nakagami continues to show improvement. After taking Q1 in Argentina, Nakagami went on to finish seventh for his third consecutive (and third career) top ten finish counting last year’s Valencia finale. The Q1 goatfest was dominated by ascendant Japanese heartthrob Takaaki Nakagami who was, in turn, joined in the bar mitzvah to Q2 by Pol Espargaro and his KTM RC16, who annoyingly stole the Q2 promotion very late in the session from older brother Aleix on the Aprilia. The second-most surprising report for the day was submitted by the Suzuki team of Rins and Mir, neither of whom could get anything going and who would start Sunday from 16th and 19th positions respectively. I had picked one of them for a podium the following day. As if. Quick work from his crew helped Marc Marquez secure pole position. Q2 took off in short order and Marquez shot to the top, working a two-stop strategy. He messed up the hot lap on his #2 tire, returned to the pit, waited while the crew mounted a third rear tire (bike #2 being unavailable after having the chain come off during FP4), and went back out to set the pole lap in front of Dovizioso and Viñales. Row 2 was comprised of Valentino Rossi, Miller and Franco Morbidelli, one of four (4!) Yamahas to qualify in the top seven. The 2019 iteration of the Yamaha M1 is better than the 2018 version in that it is able to generate at least one hot lap per session. This is big news. As is Cal slipping to 8th after being fast all weekend. And Jorge Lorenzo slipping down to 12th after his 11th place “hot lap” was deleted for exceeding track limits. Jorge Lorenzo’s best qualifying lap was tossed out after he ran wide and into the green zone on Turn 14. Xavi Vierge set a new track record in the Moto2 class. Expect this trend to continue through the season with the new Triumph Moto2 engines replacing the older and smaller Honda engines. It was a good day for fans of the Doctor as Valentino Rossi finished second. Rossi is now three podiums away from 200 for his career. If only there were some way to inject some drama in today’s race for the flag. Marquez had things his way all weekend, other than the mechanical issue in FP4. Practices were a breeze, qualifying was a breeze, and the race was a laugher, over almost before it started. Under clear skies, Marquez took the hole shot at the start, found clean air on the back side of Turn 1, and was off to the races. He led the field by 2.5 seconds at the start of Lap 3. His lead got above 12 seconds late in the race before he backed off, and he still won by over 8 seconds, an eternity in MotoGP. Rossi returned to the podium for the first time since Germany in 2018, finally overtaking Dovizioso for good on the last lap and sending his thousands of disciples into paroxysms of joy, the 197th podium of his ridiculous career. Although he clearly won it on his own, Marquez had plenty of help from his challengers. Both Viñales and Lorenzo got completely swamped at the start, Viñales converting a second spot on the grid to his customary 8th position after two laps, The New Viñales looking much the same as The Old. Lorenzo, meanwhile, appeared to be in third gear when the red lights went out, quickly falling to last place before reaching the first turn. Lorenzo did manage to finish – 12th, 28 seconds behind his teammate – while Viñales got taken down from behind by fellow Yamaha pilot Morbidelli on Lap 25. Morbidelli’s brain fart cost Yamaha two additional spots in the top eight, and what might have been a post-race party in the factory garage may have become, instead, an inquisition. Argentina was a less than positive experience for Rossi’s teammate Maverick Viñales. A poor start was on him but the blame for the last lap crash falls on Franco Morbidelli. Crutchlow, another fast mover all weekend, did his part to ensure Marquez’ win by jumping the start and assuming 22nd position exiting his ride-through penalty. He ended up scoring three (3) points on a day he should have podiumed. After the race, he appeared to be in hurry-up mode on his way to Race Direction for a free frank exchange of ideas, where Mike Webb would squelch most of his ire with electronic proof of his error. Jack Miller chased down factory Ducati rider Danilo Petrucci on his way to a fourth-place finish. Jack Miller had his Pramac Ducati in the top five all day before finishing 4th, while Danilo Petrucci ended his day 6th after starting on the fourth row. My boy Álex Rins, who got faced in qualifying, starting 16th, got his groove on late in the day and settled for 5th place after a brief podium flirtation with a couple laps to go. His teammate Joan Mir was stuck in the mud all weekend, and called it a day with four laps left, gremlins at work in his machine. As proof that every dog has his day, KTM pilots Pol Espargaro and rookie Miguel Oliveira placed 10th and 11th, while Aleix Espargaro put his Aprilia in the top ten along with LCR Honda’s Nakagami and that pesky rookie Quartararo again. To me, when it comes to Yamaha, there’s Rossi, and then there are the other three guys. Lorenzo Baldassarri won his second-straight Moto2 win and looks like the early favorite for the championship. All in all, the worst fears of the entire industry were realized as Marc Marquez seized the lead in the championship, dunking on the pseudo-Aliens and now heading to Circuit of The Americas. For his putative challengers at the top of the MotoGP food chain, this must feel like being duct-taped to a steel bench having to watch a video loop of Marquez passing them over and over again, each time bumping them into a trackside mud puddle. Painful, frustrating and embarrassing. No wonder everyone’s in such a hurry to get back to Spain. Jaume Masia led the charge in Moto3.